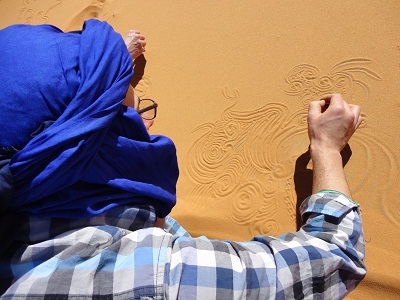 Fancy a timeout in the Sahara? 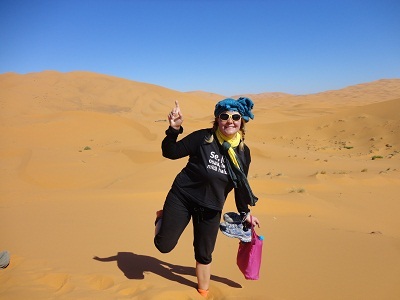 Guys, it’s that time of the year again – the time to sign up for the Road Junky Sahara Retreat in the Sahara Desert in Morocco! If you could only do one cool thing in your life, this one would be a pretty strong contender if you ask me. 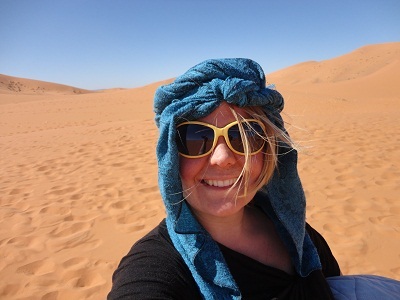 As you may remember, this past February I was one of the 24 lucky ducks who managed to take a week off from the modern world and surround themselves with nothing but sand, dunes and bypassing camels. And what a week it was, as you may have read from my post back in March. 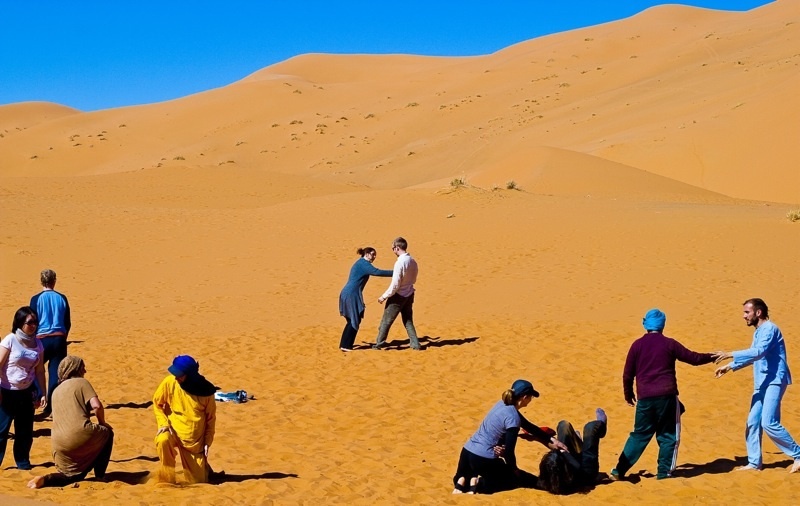 The next retreat will take place sooner than you think, from Jan. 27 – Feb. 2, 2013, so jot down the dates in your calendar and dust off those dune shoes (just kidding, there’s no need for that – it’s much easier to walk up and down slippery sand slides without shoes!). So what can you expect to get in return for you 295 euro attendance fee? 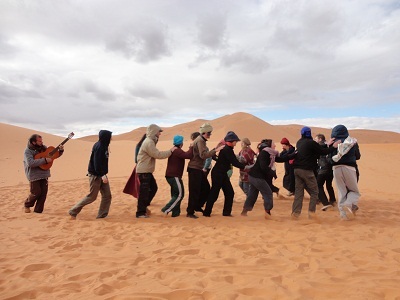 In a nutshell: unreal desert scenery, interesting classes such as yoga and aikido, simple but tasty local food, accommodation in shared Berber-style tents, travel stories shared under the full moon by the bonfire and lots of new friends. Most people come to the retreat by themselves, so don’t be afraid to do the same. 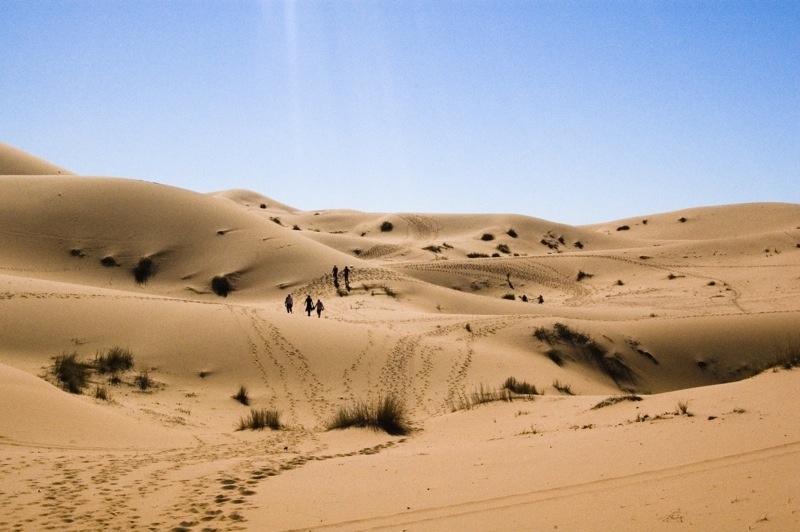 Transportation to the meet-up spot in Merzouga is not included though, so you’ll need to find your own way to Morocco (I flew with the superb low-fares airline Norwegian Air but you could also check out Ryanair. 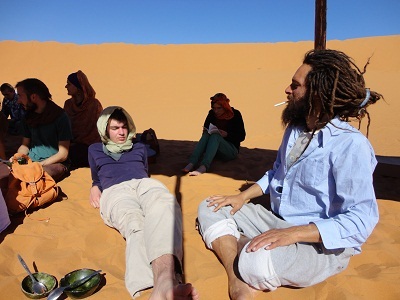 In February their flight from London to Morocco was 25 euro – you can’t beat that). 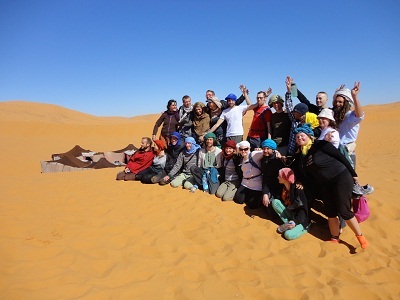 Most Sahara Retreat participants fly to Marrakech, and embark on the 10-hour bus ride to Merzouga together as a group the day before the camp starts. Will there be broadband internet connectivity? Can I get a banana milkshake in the shade? What if the guides belong to Al-Qaeda? PS. If you think you might want to go but are not sure yet, don’t worry. Last time I signed up about two weeks before the starting date and that was fine! But of course if you want a spot for sure, you might want to get cracking on this one. 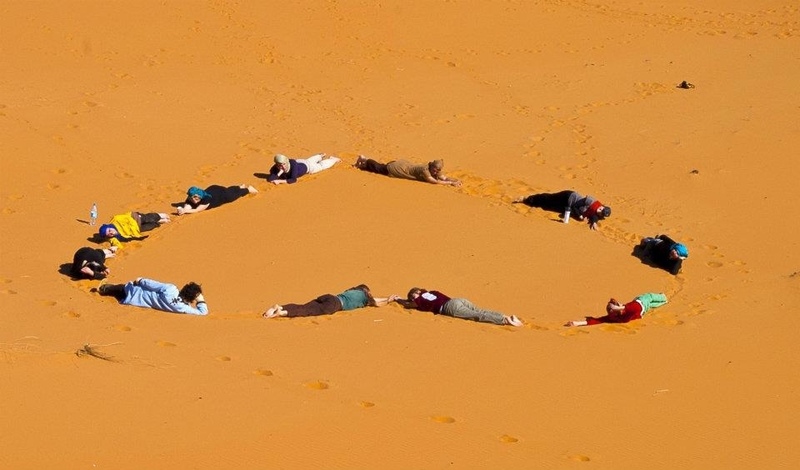 What happens if you bring 24 strangers together and isolate them from the world for six days in the middle of the Sahara Desert? Unexpected things, I tell you. 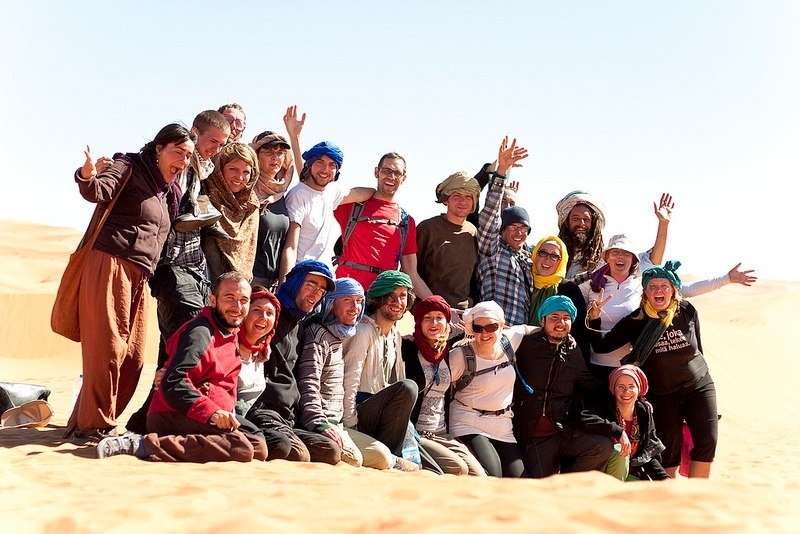 And I am speaking from experience, as I was one of these 24 travelers to take part in The Road Junky Sahara Retreat this February. The retreat, which I randomly came across online in January, was the main reason I chose to start my African tour from Morocco. 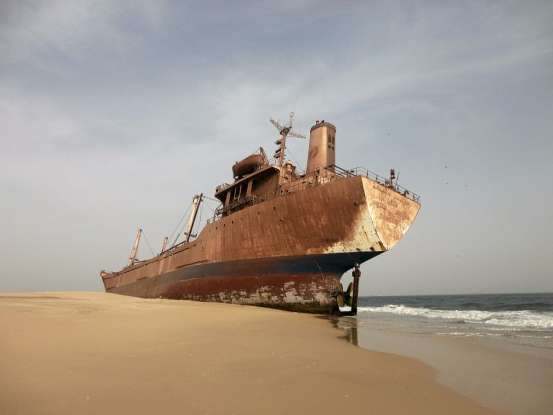 In case you haven’t heard of Road Junky Travel, it’s a web magazine dedicated to travel stories and videos. 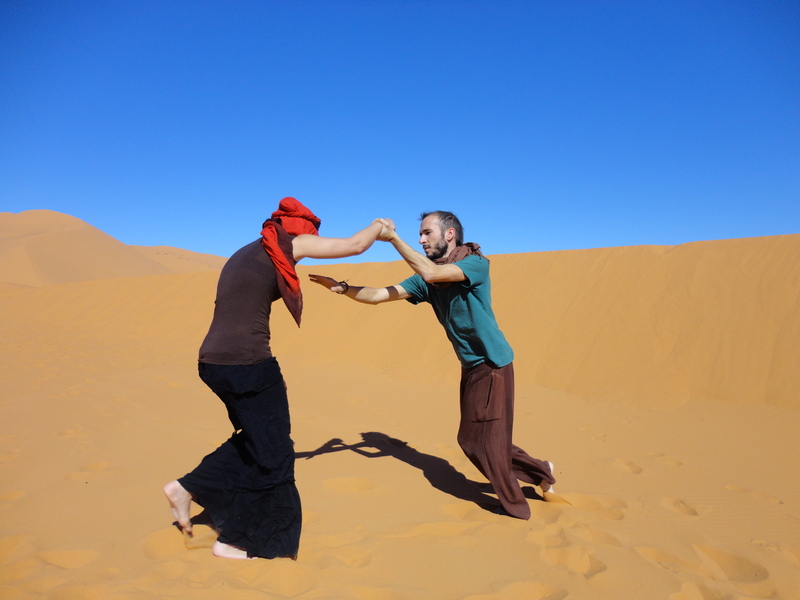 This year was the second time that Tom Thumb, one of the website’s founders as well as a writer, storyteller and permanent nomad from England, organized this retreat in the desert. As last year’s camp was such as success, Tom decided to make this year’s stint a day longer, five nights and six days. 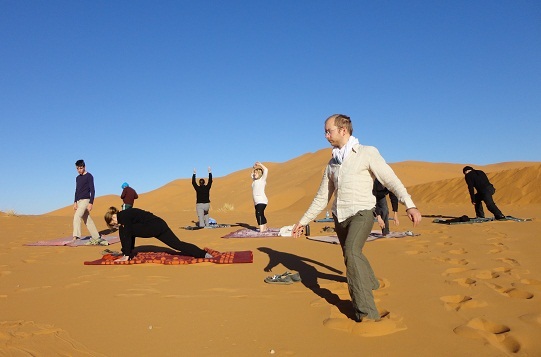 The Road Junky Sahara Retreat was advertised as a travelers’ meet-up, and a chance to meditate in the vast emptiness of the Sahara, and participate in workshops of yoga, aikido and dance. There would also be travel stories shared around the fire, and evenings spent listening to Tom reciting tales from the “1001 Nights” collection. Those of you who know me probably remember that I am not into yoga, I definitely never meditate and I have never expressed even the slightest interest in aikido. A few years ago at the CUNY Graduate School of Journalism I did participate in some martial arts classes held by Sensei George, but mostly just to show my support. I was never a natural-born Jackie Chan, nor into any remotely hippie-sounding spiritual stuff. when I am far away from the hustle and bustle of city life. Three days is usually the max I can handle being in a remote location without getting anxious. photos, and whether I could actually learn to enjoy these activities I had no previous interest in. 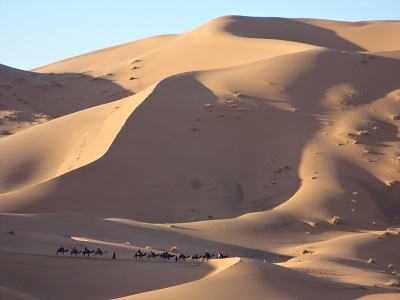 As I mentioned in the beginning, unexpected things will happen if you bring 24 people to the Sahara Desert. An anti-American hippie will befriend a clean-cut Midwestern guy, a vegetarian will succumb to the smell of delicious chicken tajine and a reserved German will throw himself in the middle of a cuddle puddle of entangled human bodies. Unlikely friendships will form, long-overdue tears come running out at the sight of the most beautiful sunset and strangers will care for each other as if they were family. 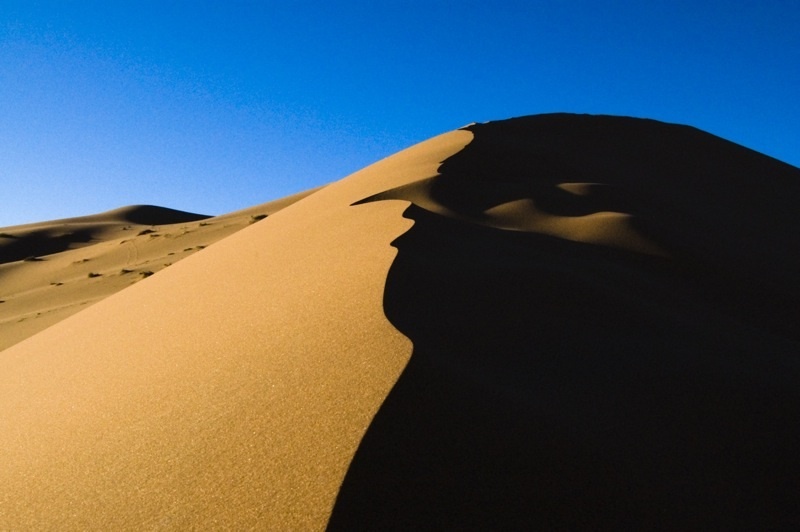 A black-clothed heavy metal singer with a pony-tail Mohawk will turn into a hug monster, and a sandstorm will blow away a songwriter’s creative block. A hyper, cynical city girl will enjoy yoga, aikido and dance therapy lessons held in the middle of nowhere. Yes, that was me stretching myself in unlikely positions at the crack of dawn, welcoming pretend-attackers into my invisible circle, searching for my sphere of energy and sensing that of others. Without thinking about how silly I looked, I allowed myself to imagine I was as light as a feather dancing in the wind and as heavy as a stone laying in the sand. I learned to lean on other people both physically and mentally, which is at times hard for those of us who are fiercely independent souls. No matter how “hippie” some of the exercises seemed for my taste, I decided to face this retreat with an open mind and see if it would lead to something new, whatever that might be. After all, “if you always do what you always did, you’ll always get what you always got.” And I did enjoy doing things differently for a change, and interacting with the types of people I normally do not encounter. And though I was even contemplating trying to meditate to the sound of people humming “ommmmmmm” around me, I didn’t quite get to the right mindset for that. The retreat was so action-packed that I just didn’t have time! 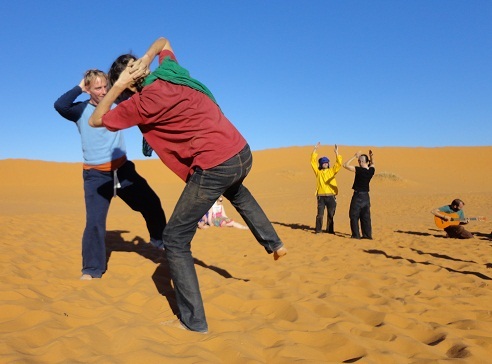 -Aikido for 45 mins to an hour: exercises with a partner, pushing, gentle shoving, how to avoid an attack by moving along with the attacker’s movements instead of fighting them. -Lunch: Bread with Moroccan soup consisting of orange broth with bits of tomato and quinoa. Orange slices for desert, as well as dates, wafers and nuts before and after lunch. More tea. 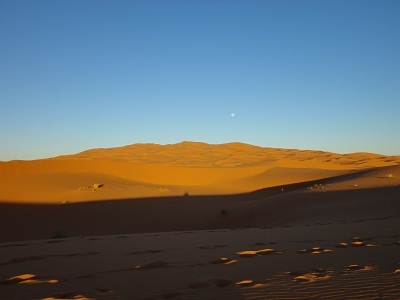 -Time for sunset: climbing up one of the highest dunes to see the view. This is harder than you’d think. 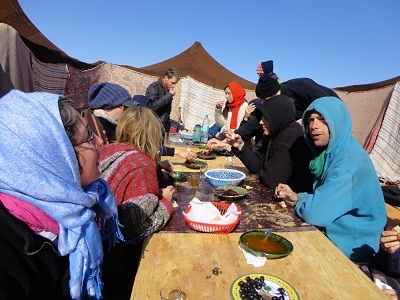 -Dinner time: chicken tajine, veggie tajine eaten out of communal bowls. Bread, tea and orange slices for desert. Overall the retreat was great fun and definitely helped me empty my mind of daily worries for a bit. 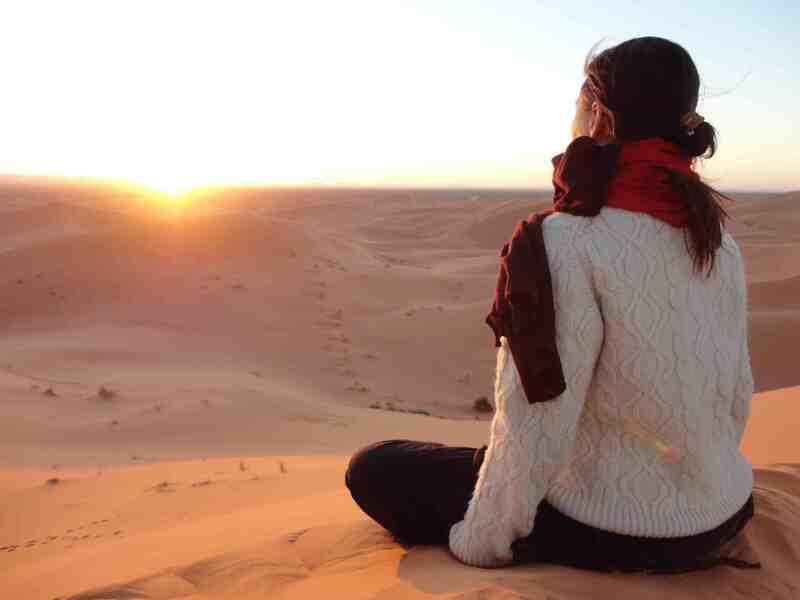 Some of the things others mentioned enjoying were the friendships, sunsets, losing track of time in the desert, workshops, feeling the connection to the earth, sensing love and peace, seeing the moon rise out of the horizon and finding new energy for the future. All very hippie-sounding, but I guess that’s not such a bad thing after all. If you think this retreat could be for you, keep checking the Road Junky website for details. The next one should be announced in the fall, and will be held around February/March 2012.